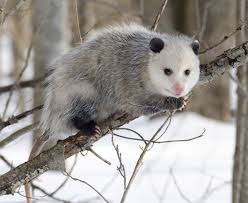 Have you ever seen an opossum or possum as most in the United States call them? They are omnivore (eating mostly vegetables and fruit and a little meat) mammals. 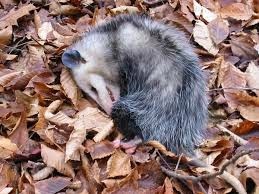 Skittles is a possum that lives in Virginia, USA. 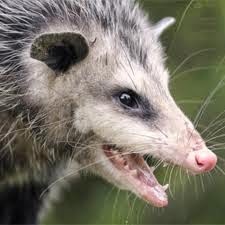 He is cute for a possum. He has 50 teeth, fur, big mouth with a long snout, pink nose, and a long hairless tail. Skittles uses his tail like other possums, carrying light objects like twigs and leaves. His tail is not strong enough to support him if he were to hang from it upside down. Early in his life, his mom noticed he was skittish and frightened easily. At first, skittles hid behind his mom if he was frightened. As he grew older, his behavior got worse. One day while walking in the woods, they heard a bobcat. This frightened Skittles terribly. He screamed and fell on his side as though dead! Skittles lie with his eyes partially shut, mouth open and foaming. “Skittles, what’s wrong? What are you doing?” his mom asked. He didn’t move, even when she prodded him. He stayed that way for over an hour. She sat by his side. Finally, he woke. Skittles frowned, folded up his under lip, and followed his mom. They didn’t have far to go. At the base of the large tree, Skittles stood looking up. “See the moss? It’s slippery.” he said. Skittles started his climb, taking it slow. Down he went. Bumped into his mom and fell all the way to the ground with a thud. “Skittles!” she said as she scurried down after him. He lay on the ground not moving, in the same way as before. 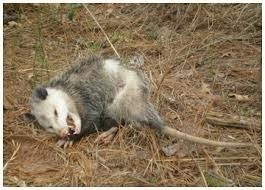 She didn’t know if he was “playing possum” or was actually dead. Skittle’s mom explained and Aunt Helen waited with her. “Let me check you for injury.” she said. She touched all around his body and got to his leg, when he cried out. The leg was broken. She went in search of things she needed while Aunt Helen stayed with him. A strong straight twig she used to immobilize the leg. Then she wrapped a vine around securing it to his leg. She helped him up. They said good bye to Aunt Helen and made their way home. Skittles learned not to worry and he hardly ever “played possum” unless it was a real crisis, like the time the grey fox attacked. But that’s another story. Memorize one or more: Matthew 6:25 Therefore I say to you, do not worry about your life, what you will eat or what you will drink; nor about your body, what you will put on… Verse 31 Therefore do not worry, saying, ‘What shall we eat?’ Or ‘What shall we drink?’ or “what shall we wear?’… For your heavenly Father knows that you need all these things. Verse 34 Therefore do not worry about tomorrow, for tomorrow will worry about its own things. Sufficient for the day is its own trouble.